One of the key seniors on the Brookfield Central state-runner-up football team never made the roster, threw a pass, had a reception or made a tackle. Unless you are familiar with the Lancers program, you probably never heard of John Richter. Richter was an official assistant coach on the Lancers team this year, something he knew he wanted to do ever since he started playing football in the Jr. Lancers program. "Ever since fifth grade, my first season of football, I got the idea I wanted to become a coach. Then from there it spring boarded itself. Through juniors (Jr. Lancers) I would help out. I would be the scout team's quarterback because I knew the other team's offense. Richter slowly eased himself into the position his first three seasons at Central, while playing JV his first two years. 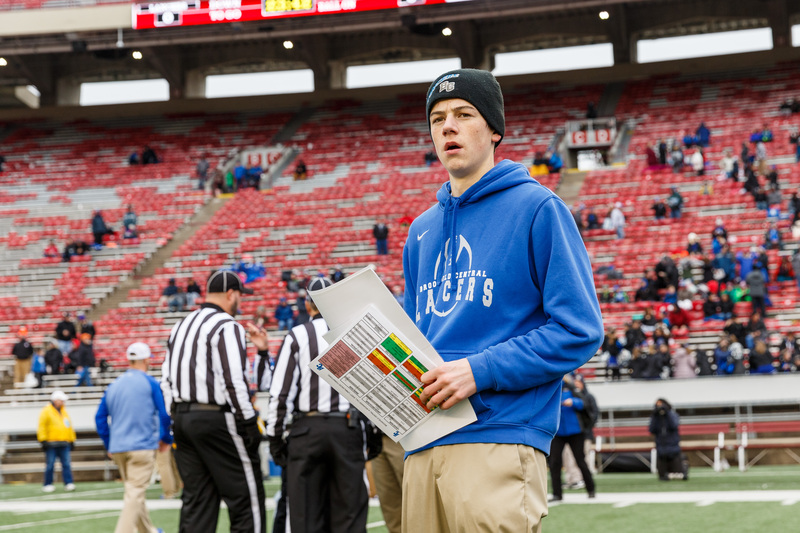 Photo by Alan Herzberg, SportsPhotosLLC --- Brookfield Central coach senior John Richter takes in the atmosphere before the state championship football game this fall. "My freshman year I approached coach (Jed) Kennedy about staying on the sidelines in the games because I told him what I wanted to do (be a college coach)," Richter said. "My sophomore year I played on JV and I stood on the sidelines (for varsity games) and I did a couple blitz charts showing what kind of stunts the opponents were using and then got that info to coach (Joel) Nellis (offensive line coach)." Richter then looked to make a complete switch from playing to coaching his junior year. "It was the Friday before we started - the July 4th weekend - I had this idea," he said. "I knew I didn't want to play. I wanted to start my football coaching career. I wanted to jumpstart it early." So Richter contacted Kennedy and set up a meeting. "I called coach that night and we talked it through," he said. "I met with him and he told me to practice for a week. I went through the first week of training camp and I told him I really didn't want to do this (as a football player). I wanted to start being involved coaching-wise. So that's when that started. I helped out with anything that they needed. In terms of what they couldn't do, I would help them with." Kennedy knew Richter was part of the youth program. "He was really little, not very big (John is 5-feet, 11 inches, 135 pounds today)," he said. "His goal was to be a college football coach and he felt this way the best way to set himself up. So he latched on to the coaching role. "I talked to his dad (Dave) and we thought it was a win-win for everybody." Kennedy had never run into a situation like this during his coaching career. "This is a first," he said. "I don't know if there has ever been a kid to have the passion, the knowledge, the will to be a coach. If you looked at the body of work he has done, you would think he was a coach for a long time. "Even in his first year of coaching, he didn’t dip his toe in the water, he jumped in head first. It was an unbelievable experience. He sent me a message after the season was over thanking me for everything over the last four years. "But the reality was I was really the lucky one and our staff were really the lucky ones to work with John. He was just unbelievable. He's mature beyond his years." Kennedy explained that Richter did everything that a coach would do. "He attended staff meetings. He was instrumental in putting the no-huddle stuff together," Kennedy said. "He made bands for the no huddle. He was involved in the practice plans, the administrative duties with the offense. Except for the fact he looked like a high school kid, you would have never known." Kennedy made it clear to his coaching staff that John was not a manager. His goal was to be a college coach when he grows up and he wanted to get the experience about how it works. How one program does it. 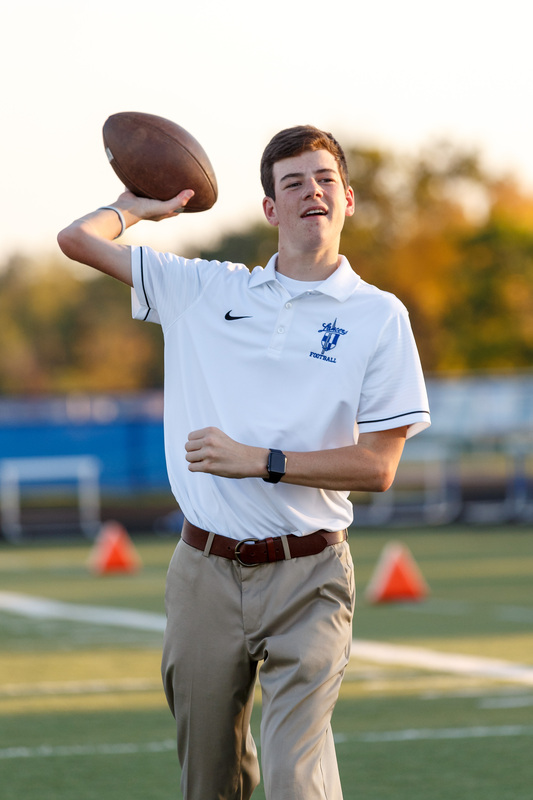 Photo by Al Herzberg, SportsPhotos --- John Richter ran the scout teams ever since he was in the Jr. Lancers program in fifth grade. That's when he knew his future was in coaching. What was even more important was how would his teammates accept him as a coach. The answer wasn't surprising. "These were guys I have been playing sports with since I was third-fourth-fifth grade," John said. "I think they all have seen how hard I worked at it. And I have been so open about what my goals were, they knew this is what I want. They were all supporting me. It's really cool. It's fun watching them under the lights, but they all support me on my side of the game, especially during the week when I'm working." Richter recalled meeting coach George Machado, the new quarterback coach and has quite the background himself. Richter then spoke out about what he needs to do to be successful. "He brought me in with coach Machado in March and told me I would spend the majority of the time working with him. I ran with that, helping him. He is very influential in the passing game. I also worked with coach (Chris) Freiman (wide receiver coach). "I did everything from making the wristbands which we wear in the game on the 'no-huddle' plays. I did all the defensive make-up for the staff. I would help out in practice with the quarterbacks and offense, running drills and stuff like that. I would help coach Machado with that. I would be with him, talking through what the plan of attack was." Kennedy pointed out Richter's strong points on the job. "His organizational skills, his communication skills, his unselfishness," the veteran coach said. "He made us a better football team. Our coaches' support says the most. They refer to him as coach Richter. They accepted him as a coach from day one. It never had to be addressed because it was never an issue." Richter also talked about his strong points. "I'm a very driven individual," he said. "I set goals for myself. If I write them down, I have a better chance for succeeding - every goal I have for the next four years and college and what I want to pursue. I have them written down and I have ways to attack it so I can try and get it because I know the percentage of people who make it in the field is so small, so I have to work even harder." When asked, Richter was quick to answer his favorite part of the job. "Obviously the Friday nights, I really like the reward (being on the sidelines for the game)," he said. "My first three games I was a floater, just helping out on the sidelines with that. After week three - coach (Kennedy) doesn't wear a headset, so I would wear the phones and I was the voice between coach Kennedy and the (coaches) booth in the pressbox. "So coach Kennedy would call the play, I would be right next to him, talking through it, asking what they (coaches in booth) see and relay the message to coach Kennedy. I was on the phones with coach Machado, coach (Jacob) Ruf (offensive line coach) and coach Nellis (offensive line coach)." "The key thing I learned - how badly you want to succeed," he said. "It's like a grind for five months. Finding a way to get to the players that you know they can understand. It's can be a successful game plan. You can have all the ideas. But to run them in a game is a whole different animal." 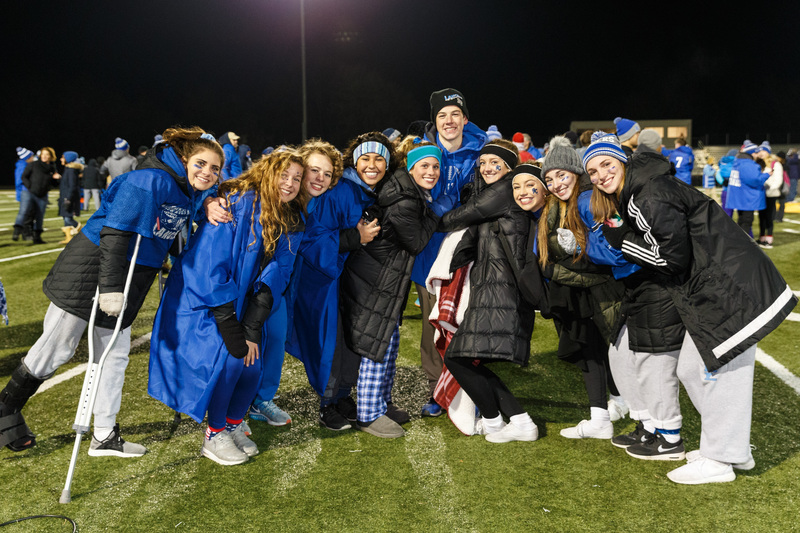 Photo by Alan Herzberg, SportsPhotosLLC --- Brookfield Central senior John Richter and a group of Lancers fans celebrate another victory in the playoff run. Richter also like the prep work. "I really like the meetings and the plan of the attack for the week. If I can continue this (as a career) I can figure out a plan for the week. I really enjoyed it. I wouldn't say much, I would sit back and listen and take in as much as I could." Richter also learned the difference between being an assistant and calling the plays himself. "They would give me scripts to call plays during practice," he said. "Before the game I would run some drills - they gave me routes to run. But the best way to learn is to actually do it. So they also gave me the opportunity to call the JV game against West Allis Hale. "When you're the one actually making the calls, it's a completely different game. You can always talk about it, but until you're really in it, you don't realize it - thinking ahead for play calls and like seeing and subbing - so many different things. "That's experience that you can't buy. You have to be hired to get that experience. To give me that experience as a 17 year old senior in high school it was unbelievable. I would never have imagined that when I was starting four years ago." Richter is constantly doing things to get better, know he has a lot to experience yet. "I watch a lot of videos on You-Tube that you can look to for leadership and motivation," he said. "Coach Kennedy is probably the best leader I ever met on getting a group of guys to buy into an idea. In this day and age, it is extremely hard to do. You have to find that common goal to work toward and get everyone to achieve it. "You could see that in basketball (last year) and football getting to state. I've been extremely blessed at Central to have such good leaders in my life. I think it is extremely important. "Coach Kennedy changed my life. I knew I wanted to be a coach, but I never imagined the opportunity I would get at Central and when he gave me those opportunities it motivated me that much more to want to do it. "He's influential in the community. Learning from him and seeing how he interacts with everyone. It has be helpful to learn. And he has so many resources and connections we have been able to meet. It's been awesome." ​​ Kennedy had high praise for his prize student. "It's a question of whether he'll hire me or not," Kennedy said, laughingly. MOST MEMORABLE MOMENT: Finishing second at State this fall. WHAT DO YOU WANT TO DO IN THE FUTURE: Attend University of Wisconsin (Business) or University of Minnesota (Sports Marketing). Would like to be involved with the football program and eventually coach college football.